Our country's shift toward expressive individualism and away from role orientation may have led to the decline of the American family and society, but that is offset by the fact that people are much happier these days, right? Um, no. 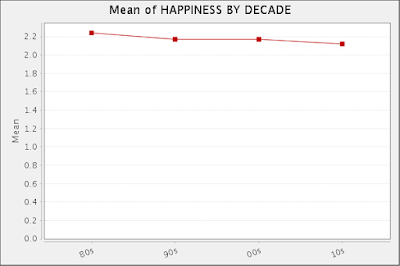 The graph shows reported happiness between the years 1972 and 2008. There hasn't been any change. The same is true for women as well as for men. We've taken a wrecking ball to the family, and what have we gotten for it? Zilch. Yes, but what you have done is optimize female choice. Women now have NO restrictions on choice whatsoever. And THAT is what has wrecked the nuclear family. Women won't choose beta guys, much less to stay with them, unless they are forced to do so by restricted choices. Choices bounded by economics, social pressure, custom, and the law (being the least important). Whiskey, would you care to back up your claims with data? First of all, I don't think "a shift toward expressive individualism" explains changing family trends, but even if it did, that argument goes both ways. If social well-being hasn't declined, then what is the argument for preserving those structures? Second, if you aren't being disingenuous, you've trapped yourself with this argument. America is actually an exception in its subjective stasis. Almost every country in the world that has economically developed has secularized, lost traditional family structures (pp 39-40), and increased in happiness. So, assuming the trends are functionally related, it is generally a good trade-off. Third, African-Americans have significantly increased in subjective well-being, even as their traditional family structures have dissolved. "The top lines show that in the 1970s women were more likely than men to report being “very happy”, while this differential began to evaporate in the 1980s. The bottom two lines show that in the 1970s men and women were roughly equally likely to report being “not too happy” and a gap emerges in the 1990s with women more likely than men to report unhappiness. Thus the decline in women’s well-being occurs across the well-being distribution". (The theme of this post is just read the collective papers of Justin Wolfers and Betty Stevenson). How do you set the GSS so you can parse the data into a time series? iPhone Ringtone Maker, a smart iPhone ringtone creating tool, can convert almost all mainstream videso/audio formats including AVI, MPEG, WMV, DivX, MP4, H.264/AVC, AVCHD, MKV, RM, MOV, XviD, 3GP, WMA, WAV, RA, M4A, MP3 to M4R iPhone ringtone, and transfer the converted M4R ringtone to iPhone directly without iTunes. Apart from converting common formats to iphone ringtone, the iPhone Ringtone Maker even supports converting music purchased from iTunes store to iPhone ringtone. End of the nuclear family?